Making needlepoint fun, easy & affordable! Have you ever wanted to learn needlepoint? Are you an experienced stitcher looking for something new? Would you like to have help picking threads and stitches to make your needlepoint sing? Needlepoint is a new old-fashioned craft, just waiting for you to use it to embellish your clothing, make unique and fashionable accessories, and decorate your home. You can make wonderful needlepoint without learning complex techniques, without spending a fortune on a custom stitch guide, and, most importantly, have fun while you stitch. 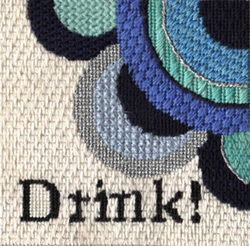 Her approach to needlepoint has been hailed as "delightful" and "charmimg." Stitchers have found that, using her guides, prevously difficult techniques become easy. Using a Napa Needlepoint Stitch Guide or Book is like having a teacher at your shoulder. Janet Perry has spent decades discovering better ways to stitch needlepoint. She has explored the worlds of threads to discover what works for needlepoint and what doesn't. She's tried every technique in the book and has developed easier ways to do them. She brings fresh approach to needlepoint which will make both new and experienced stitchers jump for joy and grab a needle and canvas. Now she is bringing that fresh approach to books,projects, and exciting cyberclasses. Her current books, Needlepoint Trade Secrets and Bargello Revisited, are now available from your local shop or through our Amazon bookstore! Napa Needlepoint provides individual stitchers, needlepoint shops, & designers with great needlepoint canvas designs, stitch guides, projects and services. We have a wide-range of products for stitchers at every level. Learn about our products & services and by them through the products link near the top of the page. Whether you are just getting started, love hand-painted needlepoint canvas, charted needlepoint, or want to try something completely new, explore the world of offerings from Napa Needlepoint. Then contact your local needlework shop or Janet (using the contact form below) to get started. Napa Needlepoint will continue to bring enjoyment & excitement to needlepointers everywhere. Be sure to visit our sister information sites, Needlepoint Plaids and Needlepoint Stitch Guides.